Kansas City-based Cerner has offered some of its employees a "voluntary departure" offer, according to the Kansas City Business Journal. "We're offering eligible associates a voluntary departure with financial and health-related benefits, providing individuals the chance to pursue other desired career opportunities," a Cerner spokesperson told the KCBJ, which reports that Cerner didn't disclose the terms of eligibility for the layoffs. In 2016, Cerner conducted a similar round of layoffs, which cost the company $36 million in buyouts. A Cerner spokeswoman told Politico that this round of "voluntary departure" offers might require further "additional adjustments" that will be explored going forward. The health IT giant has more than 24,000 employees, developing technology and support services for more than 27,500 contracted healthcare organization worldwide in more than 35 countries. It reports a cumulative R&D investment of more than $6.6 billion. According to Cerner's Oct. 25 earnings call, the company generated $1.34 billion in revenue in the third quarter of 2018, a 5 percent increase from the prior third quarter. On that call, Marc Naughton, Cerner's chief financial officer, said all of the company's key metrics were "within guidance ranges." He did note, however, that revenue was at the lower-end of the company's guidance "primarily due to lower than expected software and technology resale." Naughton said this would be "largely offset by reduced expenses." Naughton said Cerner's third quarter "lower level of software" would be expected to also impact fourth quarter, leaving the company's fourth quarter earnings outlook "below consensus estimates." But Cerner's full-year outlook was expected to remain within the company's full-year guidance range, he said. Cerner will hold its 2018 Q4 earnings call on Feb. 5. 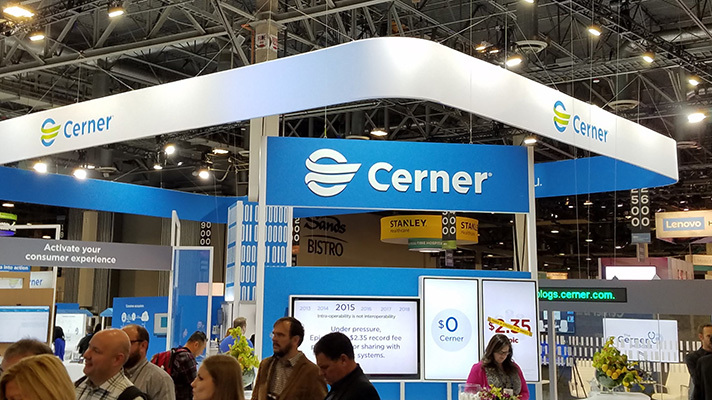 This past May, after a year-long delay over interoperability concerns and staffing shake-ups, Cerner made it official with the Department of Veterans Affairs for a $10 billion contract to overhaul the agency's legacy VistA EHR over a 10-year period to Cerner's system. In 2015, Cerner contracted with the Department of Defense for a $9 billion overhaul of that agency's VistA system. A Cerner source told Politico this week that the recent employee buyout won't have any impact on Cerner's VA or DoD EHR implementations. The House Committee on Veterans Affairs will be watching to make sure. This past July, the committee approved the creation of the Subcommittee on Technology Modernization, to provide oversight of the VA's EHR modernization project with Cerner. "As the department embarks on the nation's largest EHR overhaul, it is critical that we ensure veterans and taxpayers are protected throughout the transition," said House VA Committee Chairman Rep. Phil Roe, R-Tennessee, at that time. "Congress has a duty to conduct rigorous oversight every step of the way."